My question was: What is the purpose of dreams? I also want to know what part of the brain dreams come from? Are dreams trying to tell us something? Are dreams trying to warn or prepare us for something? Sleeping is a big part of what I researched I needed to know the stages of sleep and what stage it is you dream in. Sleep is a state when your body is inactive and you mind is resting and when your eyes are closed. Sleep is divided into two basic types REM (Rapid Eye Movement) and NREM (Non-Rapid Movement). When you first fall asleep you enter NREM and as your sleep gets deeper it becomes much harder to wake up. After about 90 minutes you enter REM and through out the night you go back and forth between REM and NREM. People usually have 4-6 sleep cycles a night. During REM sleep is when the most complex dreams happen. During REM your breathing and heart rate speed up and your muscles are paralyzed to keep you from acting out your dreams. Fun fact: in the morning your dreams are more intense. People used to think dreams were warnings or predictions. For example, the oldest known dream book, the Chester Beatty Papyrus (1350 B.C.) from Egypt, said that if you dream your teeth are falling out, it means that members of your family will kill you. In traditional African-American beliefs, if you dream about falling off a barn, you’ll get married. Some people believe they enter a real spiritual world when they dream. For example, some aboriginal Australian’s believe the dreamers soul leaves their body and travels, and can sometimes encounter others. Today most people believe that different symbols in their dreams mean something depending on the persons experiences and personality. Some dreams do tend to have universal significance. Flying usually means confidence and elation, while falling means fear or failure. The basics of dreaming is also an important topic during my research. I couldn’t find a lot on dreams because nobody really knows a lot about dreams. But I did find some information. People usually have between 4-6 dreams each night, but don’t remember all or some. How to think of dreams: Dreaming is a real experience, but dreams them selves are not considered to be ‘real’. Dreams originate in the back of the brain where it is responsible for vision. A 73-year-old lady had a stroke then she reported she had a vivid hallucination, then she didn’t have a single dream for 3 months. A doctor then found in her scans that there was damage to both sides of a small part of the visual, or occipital cortex of her brain. She did wake up through out the night when she was in REM sleep which supports one of the oldest theories about dreams, we dream to protect our sleep. In other similar cases when people lost the ability to dream, scans suggest their dreams originated from the front of their brain. Dreams may not have any big purpose in adulthood, but dreams reflect mental activity in the brain, but don’t have a specific function of their own. Sigmund Freud (1856-1939) was the first person to use dreams to help his patients resolve their conflicts. Sigmund Freud believed that dreams were fulfilments of wishes and that the dreams often disguised the persons wishes. Carl Gustav Jung (1875-1961) believed dreams could express any of the dreamer’s drives or characteristics. There are a lot of theories on dreams, some of them are: Dreams may help your brain as it transfers memories into long-term memory and discards the others, some people think dreams tell the future but now scientists believe dreams help you remember things you learned through out the day, scientists also believe your dreams improve your imagination and creativity. From doing research I never did find a definitive answer to my question which is What is the purpose of dreams? But from what I have gathered I believe that the purpose of dreams is to improve your creativity, to give you a break from the real world when you sleep and take you somewhere else. I feel like if there is a natural disaster in your dream is showing you how your going to act if it happens in the real world. I truly do believe that dreams prepare you for things when you don’t even now it. I needed to research the stages of sleep.from there I researched what REM sleep is and what NREM sleep is so I could fully understand the stages of sleep. Ialso needed to research how long each stage was and what happens during REM and NREM. Then I could finally research dreams. For this project I needed to use Science in Context from the schools website thing. It took a while to get the hang of only using key words to search.We also had to use excel to log the publisher,date we accessed the information and that fun stuff but thank fully the site we had to use had all that information at the bottom so I could just copy and paste it into the excel document. I also had to use Edu blog, it took me a while to find a picture on creative commons that wasn’t really weird. Putting the videos took me a couple times even though i had to do it for my digital footprint project. My process was search something, copy and paste all the notes I need into a word document I made,copy and paste all the websites information in to the excel document and repeat until I felt I had enough information and until I felt my question was answered. I just used science in context and trusted that the little box at the bottom of everything you searched had all the correct information I needed. The process was pretty simple except for using science in context for all my information.I had to search for what I want in my search. But other than that it was pretty simple. I’m not sure what I would do better next time but I’m sure I’ll think of it when I find a better way to do something in a later project. I like the topic! I’ve always wondered what my dreams mean. 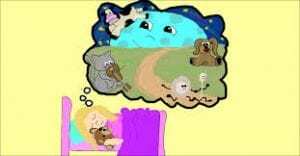 I wonder why it’s so hard for scientists to understand dreams? Awesome project! I wonder how we dream as well, keep up the good work.